The holiday shopping season is officially upon us! I personally don't like to ignore Thanksgiving and start my shopping before then so I have only recently begun making my lists and tried to take advantage of as many black Friday and cyber Monday sales as possible. There were so many of them, it was a little overwhelming. Thinking up the perfect gift can be tricky, especially if you are trying to stick to a budget so this week I thought I'd forgo the usual outfit for a currently loving gift guide edition. All of these items are under $100, in fact most are under $50, and would make lovely little gifts for a friend, mom, sister, etc. Ok, I want that How to be Parisian book :) And loving that scarf and those sunglasses! Great picks! Bring on the candles!!! I just cant get enough of them this year!! I've been lusting after those Cuyana travel cases! Great post! The travel cases! I have the olive green ones and have plans of getting my mom some :) They're extra ideal gifts because of the monogramming option! Oh my gosh I totally agree, I dont know what it was about this year but I was totally overwhelmed by black friday, cyber monday etc. I kept thinking that I needed to check all my favorite items and gift ideas to see if they were being sold for better prices..but in the end I was overwhelmed by most of it. But in the end I found a few good deals. What a great selection of gift ideas! I have those Cuyana Travel Cases and use them non-stop, they are an absolute favorite of mine! 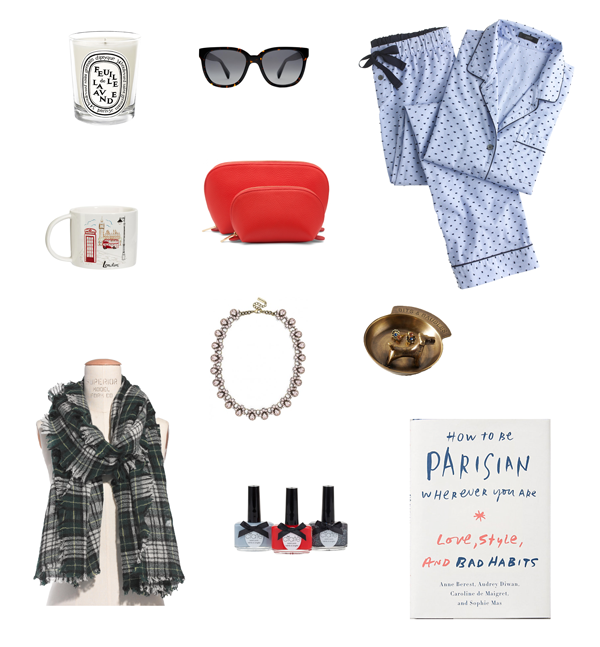 Such a fab gift guide and you're right...the sales were overwhelming! These are all just perfect!! I love that pj set and I know they would be perfect for my mom or sister!! and I want to read that book - I have been seeing it all over!